In Julie, a disturbed and possessive husband confesses to his wife about a murder. The murder of her first husband. And he’ll stop at nothing, including murdering her, to keep her from leaving him. ﻿ I have to say that I’m pleasantly surprised by Julie. It’s a very riveting movie, with excellent performances by the entire cast. Doris Day, who I tend to associates with musicals and comedy, does a wonderful performance. As does Louis Jordan as the obsessive husband – very creepy, very dangerous, and a very believable performance. The only negative is the conclusion. What’s become a cliche is the pilot being incapacitated and someone unqualified having to land the plane. I don’t know if this is the first occurrence of this trope, but it might well be. And, it has to be said that it’s well done. Something also well-done is the doctor, doing what he can to keep the injured pilot conscious. It looks and feels like a real doctor, and it’s very well-done. Kudos as well to the pilot, trying to stay awake and help her land the plane. Another good, believable, realistic performance. Has beautiful Julie Benton married a murderer, an insanely jealous man who killed her first husband in hopes of marrying her? 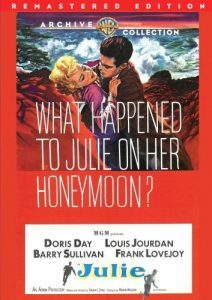 When Julie learns the answer is yes, she escapes him in a desperate attempt to forge a new life, taking a job as a stewardess. But her husband has no intention of letting Julie go…ever. Doris Day and Louis Jourdan star as pursued and pursuer in this non-stop, double-Oscar(r)-nominated thriller built around the kind of woman-in-peril plot that always jangles audiences’ nerves and is a specialty of writer/director Andrew L. Stone (Cry Terror!, The Last Voyage). As if a mad stalker isn’t enough, Julie tosses in a great Hollywood ending: our heroine piloting a jetliner to a San Francisco landing, the fate of passengers and crew in her hands.